Andy Crawford - "The A.A. Man"
This photo and story were contributed by Ken Crawford, son of Andy Crawford. Andy Hain Crawford was born in Falkland, Fife, in 1919. He grew up working on farms around the middle of Fife. He was one of a large family who remain today, as they were then, very close to each other. Andy married Elizabeth Cairncross, from Newburgh in 1940. During WW11 he served as a sergeant with the Argyll and Sutherland Highlanders. He saw action in the Middle East, Africa [ El Alemein], and Italy. 1939 - 45. 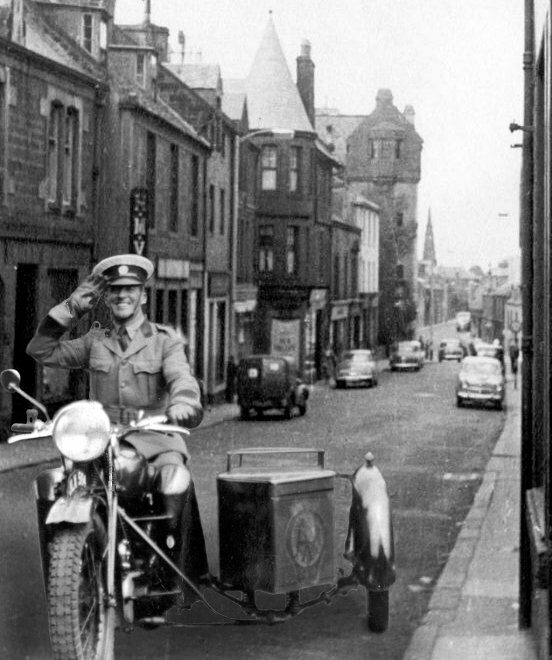 Andy joined the A.A. in 1950, and initially, patrolled central Fife, then as an A.A. [Automobile Association] sergeant, in the Borders, before moving to Maybole. On promotion in 1953 to A.A. Inspector, for Ayrshire and Galloway, Andy moved his family to Kirkoswald Road, Maybole. The family then consisted of wife Elizabeth, sons, Andrew, Alistair, Kenneth and David [daughter Sheila was born in 1957]. 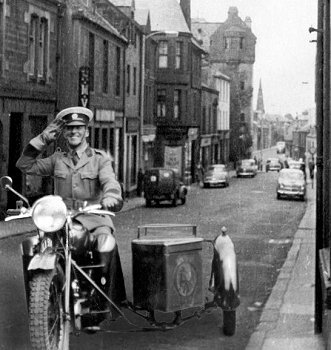 Andy became a familiar sight in Maybole, riding his A. A. motorbike and sidecar, His bike then was a B.S.A. 500cc. machine. He used four motorbikes over a ten year period, the last bike he had was a Triumph twin engined 750cc. Andy was soon well known to everyone in Maybole, and the surrounding areas, as, ' The A. A. Man'. For many years Andy patrolled Ayrshire and Galloway on his motorbike, in the rain, the snow, the sun, and then more rain and snow! He must have repaired thousands of cars and motorbikes throughout this time. Andy set up A.A. telephone boxes around his area of control. Every boy who ever joined in the 1950s Sunday exodus from Maybole, to the shores of Maybole and Croy will remember the black and gold coloured A.A. boxes at Pennyglen and the Electric Brae. Andy Crawford was instrumental in setting up the A.A. Patrol Service Centre on the Ayr by-pass. Sadly, all of these landmarks are now gone and part of history. Andy served the Ayrshire community well, sometimes going beyond ' the call of duty'. He once saved an A.A. member's car from ruin at Ayr shore, by swimming out to sea to attach a tow rope to rescue the car. Again, during a terrible snow blizzard, in the Dalmellington area, he was flagged down by a man whose pregnant wife was about to give birth. All the phone lines were down and he needed an ambulance urgently to get his wife to hospital. Andy drove up into the dangerous snow covered hill roads above Dalmellington to make radio contact and thereby arrange for an ambulance for the lady. Later that day she gave birth. [ where is the child now ? he /she would be about 40 years old now.] [Both these rescues were reported in the Ayrshire Post newspaper at the time]. Andy soon found the job meant being on call 24 hours a day, or more particularly, Andy's wife Elizabeth did! Andy's son, Kenneth, explains '' Our phone rang day and night. My Mum became an unofficial, unpaid, employee of the A.A. She took down all the calls for my Dad when he was out working. People phoned at all hours of the day and night, seeking my Dad's help. He always went out and assisted them. He never turned anyone away, whether they phoned or knocked the door. He more than earned every one of his promotions, so did my Mum ! " Andy met many famous people during his A.A. service including meeting the Queen and the Duke of Edinburgh on several occasions. 1963 saw the famous motorbike and sidecar being replaced by an A.A. mini-van. And not much later, the van was replaced, by a Triumph Herald motorcar. Andy was on a fast track of promotion during the 60s. He was promoted from Inspector, Ayrshire and Galloway, to Chief Inspector, West Scotland in 1963, then, in 1967 Chief Inspector, to Superintendent, West Midlands. Andy moved his family to Birmingham in 1967, to take up his post as Superintendent. He was now the person in charge of the whole of the West Midlands of England. As son Kenneth remembers, " For my Dad it was the Pennyglen junction one day, to the Spaghetti junction the next! Quite difference in traffic flow numbers....... and scenery ! ". It is my sad duty to inform you that our father, Andrew Crawford, formerly of Kirkoswald Road Maybole, known to many in Maybole during the 1950's and 60's as ' The AA man ', passed away on Thursday 9th. March 2006. His memory lives on through his wife Elizabeth, his son's Andrew, Alistair, Kenneth, David, daughter Sheila, his 16 grandchildren and 6 great grandchildren. We appreciate the fact that our Dad had a long and successful life and that the happiest of times were the years the family spent in Maybole. Regards Kenny Crawford. Sent on behalf of the family.